It certainly doesn’t look like spring outside – but with the winter we’ve had, I’m afraid if I waited to decorate for spring until all the snow melted, it would take until May! 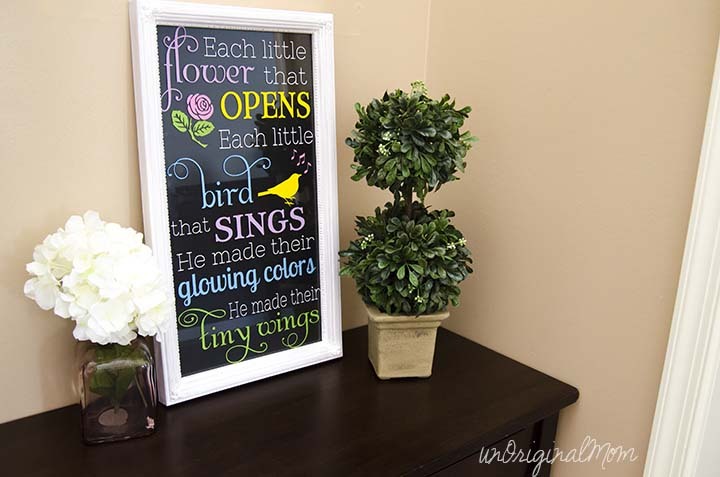 I decided to start off my foray into spring decor with some cheerful spring vinyl art. Do you know the hymn “All Things Bright and Beautiful?” I remember singing the John Rutter arrangement in church choir when I was little. It has always stuck with me – such beautiful imagery of Creation, and a reminder that God made every bit of it, big and small! 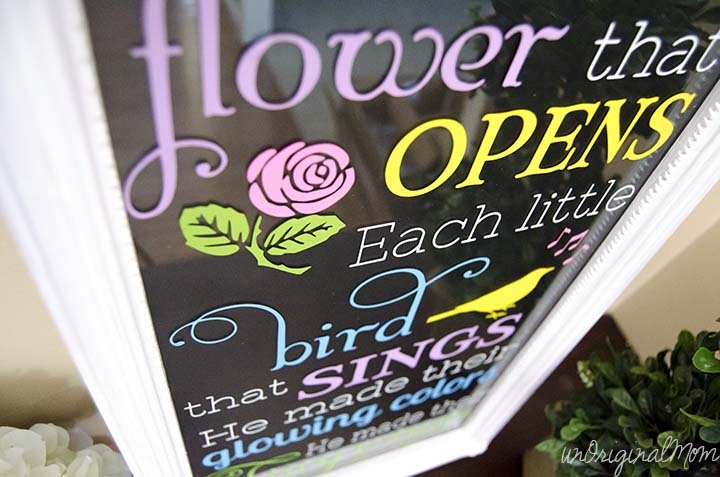 When I was searching for a spring text to use, I thought of that first verse – “Each little flower that opens, each little bird that sings, He made their glowing colors, He made their tiny wings.” It was perfect! I had ordered the Easter Pack of vinyl from Expressions Vinyl a few weeks ago (and received it just a few days after ordering!) and I decided this would be the perfect project for it. 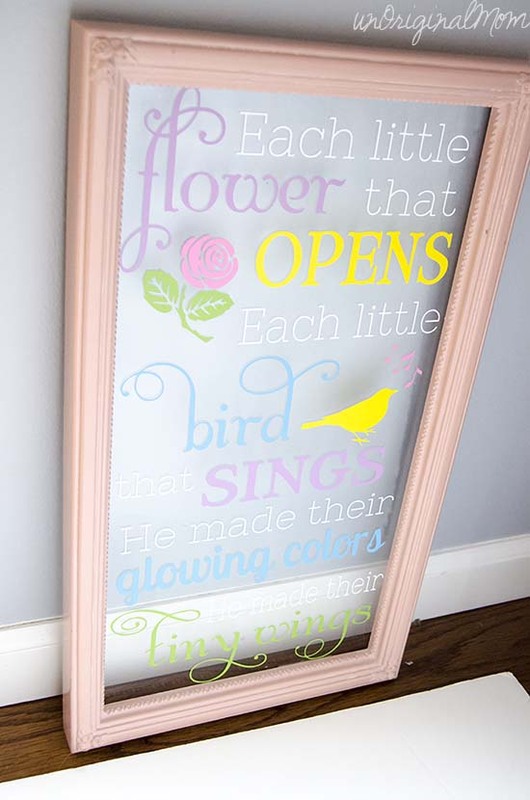 I dug up a frame purchased from Goodwill that was just begging to be used for this, took measurements, and got to designing my spring vinyl art! After lots of tweaking and font-changing in Silhouette Studio, I finally came up with a design that I loved. I used the fill tool to color the text with the color of vinyl that I wanted to use. Why yes, I would love to share my design with you! Happy almost-Spring to all! Click HERE to download the “All Things Bright and Beautiful” cut file. Because I knew there was no way I’d be able to freehand the vinyl layout on the glass, I printed out the design directly from Studio to tape behind the glass as a guide. I made sure my page size was set to “letter, then rotated the design 90 degrees. About 2/3 of the design was sticking off the page, but that’s okay – it will print whatever is showing on the page in Studio. I printed the first page, slid the design over to print the middle, then slid it farther to print the end. I lined up the pages (they overlapped a bit) and taped them together, then I taped it behind the glass. Once I’d printed my guide, I separated out the words by color and cut them out of vinyl. The vinyl I ordered was indoor vinyl, Oracal 631. It cut flawlessly using the Silhouette recommended settings and weeded like a dream! It worked perfectly! I was able to line up all of the vinyl without any trouble. No slanted text or wonky spacing here! It may seem a bit tedious, but the process actually went rather quickly. I’d say the cutting, weeding, and transferring took about an hour in total. Remember that pink frame? Yeah, I wasn’t loving it. This makes me smile every time I look at it…even if there is still snow on the ground, it is beginning to look like spring at our house! I have to say, I was really impressed with the quality of vinyl and enormous selection from Expressions Vinyl. I also ordered a bunch of specialty vinyl from them (including chrome brushed vinyl, gold leaf vinyl, frosted glass vinyl, and glitter heat transfer vinyl!! ), and I’m SO excited to try it all out! Here’s the best part – those nice folks over at Expressions Vinyl are sponsoring a $25 gift card giveaway for the readers of unOriginal Mom! AND you can get 10% off at Expressions Vinyl using the code UNORIGINALMOM, good now through March 21! Woohoo! International entries are welcome, but please visit the Expressions Vinyl website first to see if they ship to your location. 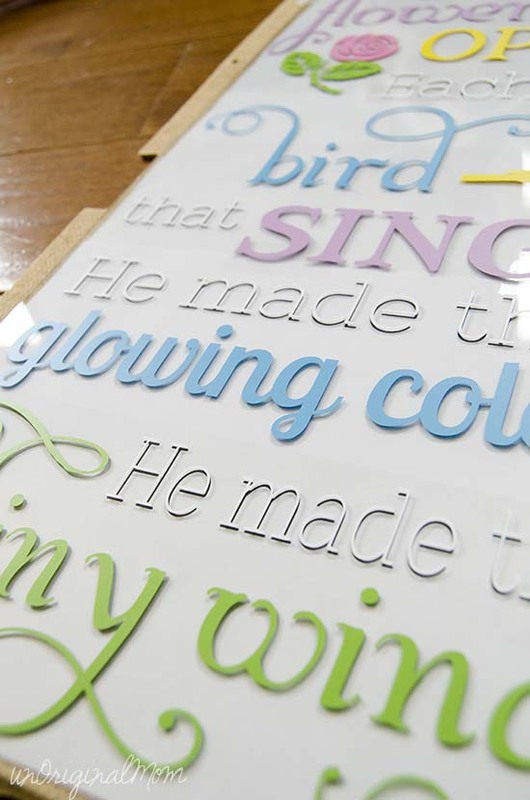 What is your favorite way to craft with vinyl? I am always looking for new ideas! 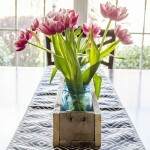 ← House Hunting Tips – Staging to SELL! On my wish list is the 12×24 cutting mat ! 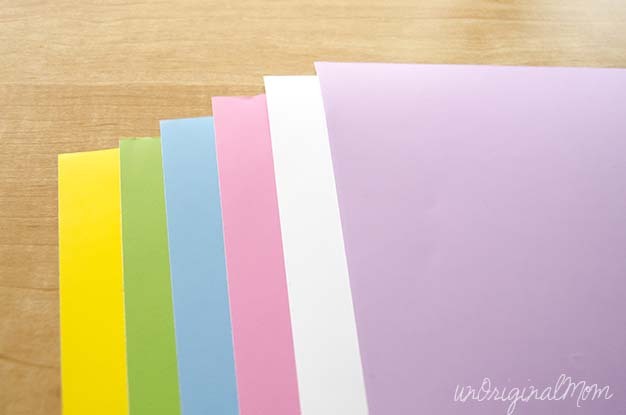 I would love to make some bright happy cards and of course something with colorful vinyl. LOVE vinyl, so easy to use and play with. Thanks Michelle! I have a growing collection of frames waiting to be upcycled, and seem to buy more each time I’m at Goodwill…it’s just a matter of finding things to put in them, haha! Rhinestones are on my wishlist too, Kelly! 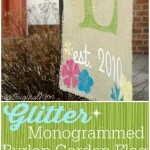 But I am afraid once I try them, I will go rhinestone crazy and want to put them on everything, haha! Didn’t know about Vinyl Expressions! Love it! Been looking for a variety pack of colored vinyl. Love the colors in the Easter pack, but I’m going for the rainbow colors! Thanks too, for the beautiful verse download! I love Expressions Vinyl!! I’ve been doing a lot of subway art lately, so I’d be stocking up on more outdoor vinyl! Wow, that trick for lining up your vinyl on the glass is genius. 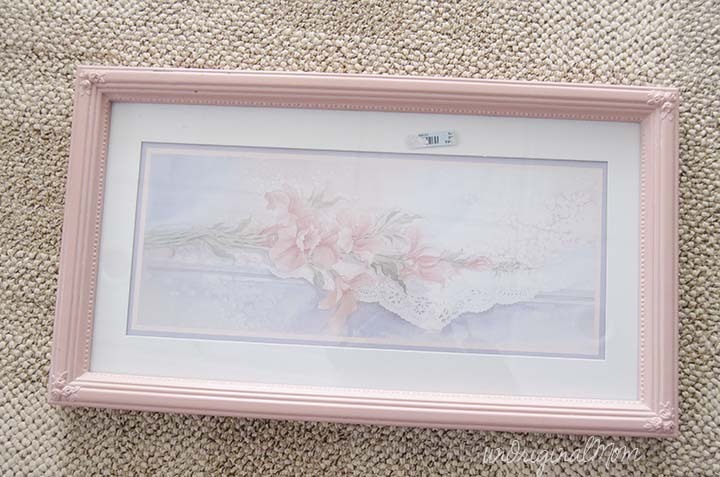 I now cannot WAIT to pick up a frame at Goodwill so I can try my hand at one. Stunning artwork, my dear. And so generous with the free cut file. It’s neat to hear about Expressions Vinyl, too! The product clearly shines in your creation. Well done! LOVE the design! Thank you so much for sharing! Before I even read your post, the John Rutter piece ran through my head when I saw the picture. Several of my choirs and choruses have performed that piece. It’s gorgeous. The item at the top of my crafting wish list would be a heat press. Your project is FABULOUS!!! That was one of my absolute favorite songs from Sunday School when I was a child. You are sooooo generous to share the SVG file with us!!! Thank you so much!!! To show my appreciation, I’ve pinned the project, tweeted about it and will share on my Peace, Love and Joyce Facebook page! I visited the Expressions Vinyl store and I would love to get a wide variety of the vinyl, especially the copper & gold leaf. The one thing I am going to buy right away is the “Vinyl is Money” e-Book. 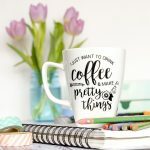 It would be great to sell some items to help support my addiction to Stampin’ Up! & Silhouette! Haha! Thanks for the chance to win the gift card. I really want the rhinestone starter kit! Loving all of the themed packs of vinyl that Expressions Vinyl has! I’d love the spring & easter vinyl packs! I’d love to use some heat transfer vinyl on tote bags for gifts! In my standard over-zealous ways, I have been checking out expressions vinyl and think I might want to buy out the whole store… you know, just to have a stash! On the top of my list is the chalkboard vinyl. I just love it! Oh my gosh! I love this Meredith!!! I’ll be scouring the thrift stores for a frame that size. Thanks Jessica! I actually bought this frame with another project in mind but it ended up being too tall…but I’m so glad I had it on hand, it worked perfectly for this project! I need (not just want) some more HTV in colors!!! I absolutely love this picture! 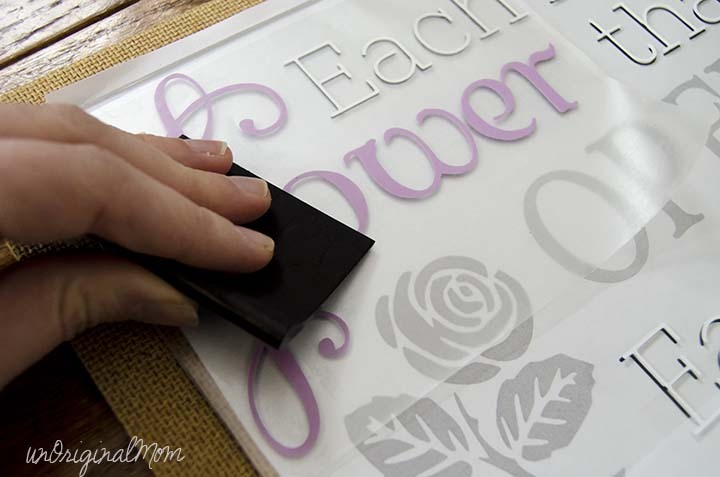 I have not ever used vinyl in my silhouette yet but seeing this pretty, I want to make one! Thank you so much for sharing this awesome idea and keep crafting because colors make the world a happy place! Thanks, Ciera! You know, it really wasn’t that time consuming…I don’t have a whole lot of patience, but I never really felt like I was running out of it for this project, haha. Especially if you use less colors, it could be done pretty quickly! This is lovely and it’s also my favourite hymn. It’s such a great one, one of my favorites too, Maria! Such beautiful text! I love you vinyl you made for spring. It is beautiful! Thank you for the download. I was wondering what size frame you used? I love the look of that. Please let me know. Thanks, Kathy! The frame I used was 10×20,” I believe. Your design is absolutely lovely – I’m singing the song, too! I had a question about contact paper as the transfer medium. I made a decal for my car and just used the Cricut paper transfer. Because it’s not see through it made lining up hard so using clear tape sounds great! But won’t the contact paper itself stick to the object you’re trying to put the vinyl on? Thanks, Debbie! Contact paper is only a little bit stickier than regular transfer tape, and it peels right off of glass with no problem. It helps to stick it to your jeans once or twice to “de-stickify” it a little bit, if you’re concerned about getting it off…but I didn’t do that for this project and it was fine. 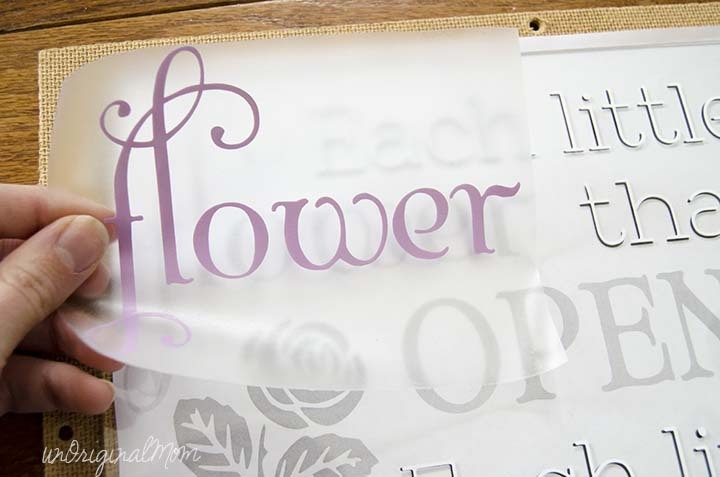 I’ve used it for many projects…including transferring to card stock, too! And it peeled off with no trouble at all. Your project is absolutely gorgeous!!! Thank you so much for sharing the file. What did you put behind the glass? What is the “black” behind the vinyl? bee giving uѕ ѕօmething informative to read? Oh wow so pretty girl!!!! =D Love the colors, fonts and the saying! That’s very pretty. Question : how or what do you use to make the back black? Vinyl ? Paint ? Construction paper? Hi Tina, it’s just plain black card stock inside the frame! This is beautiful! 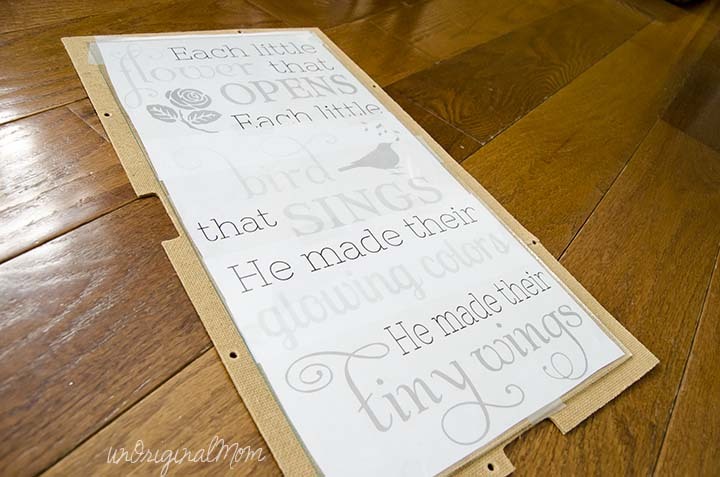 I love this project (it’s a favorite childhood hymn of mine!) 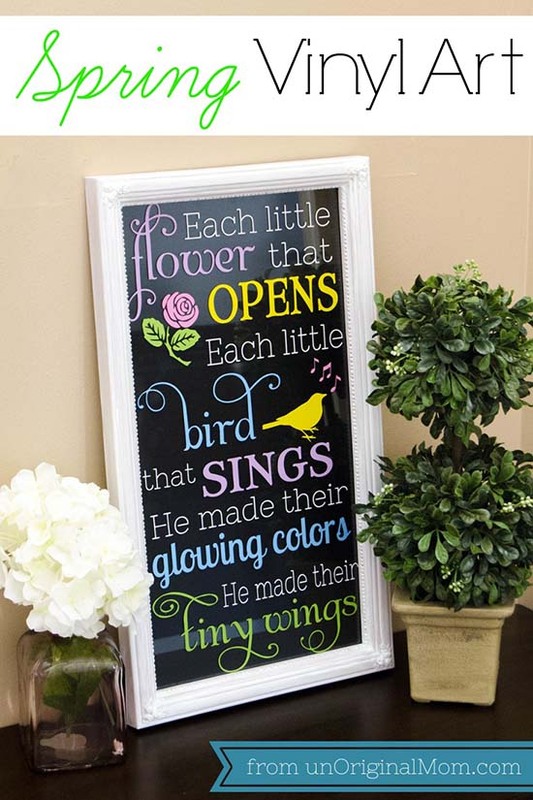 and want to try to make it for my twin girls’ bird-themed nursery before they arrive this fall. I am not familiar with studio software and use a mac. Is it possible to get the template in a PDF format? Following you on Pinterest for more ideas! Thanks! Hi Louisa, thanks for your sweet words! I adore this hymn, too. 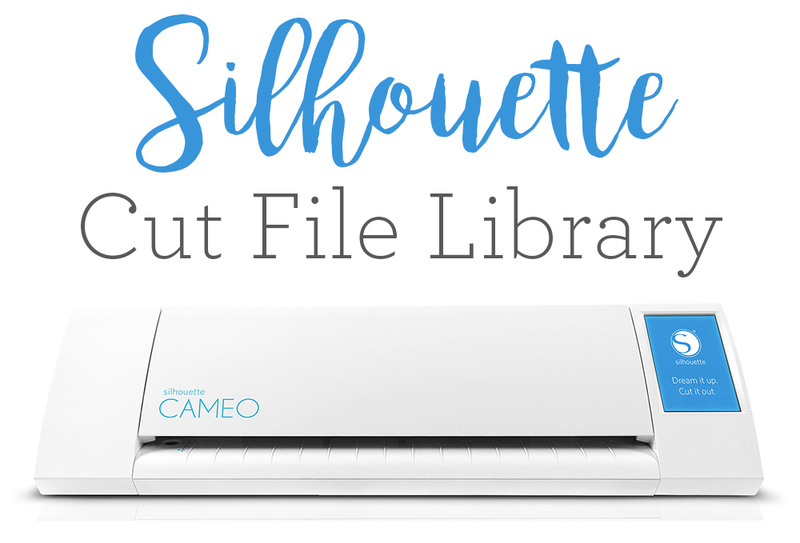 I made it by cutting the lettering out of vinyl with my Silhouette cutting machine, and the file is for Silhouette Studio (to be used only with a Silhouette Cameo or Portrait), so unfortunately it can’t be used with any other program. You could try creating your own version to print and frame, if you’d like! 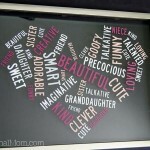 Just pick some pretty fonts – PicMonkey.com might be a good site to try. Congratulations on your little girls – I’m sure their nursery will be lovely! I’m new at this…. :). When I try and cut the small words “each” I get messed up letters or what I think are called “tags”. Then the upgrade to 4 keeps freezing. Any suggests for cutting the smaller fonts?